I was originally from upstate New York. I have lived all over the USA as well as other countries. Always interested in painting and never far from an easel, my professional career started as a graphic artist in NYC but eventually I moved to a career in fine arts. I have worked in almost every medium there is and enjoy each for a different reason. Most of my own work now is in oils. At various times in my life I have taught either through art organizations or in my studio. I have always been fascinated with the styles and techniques of the old masters. 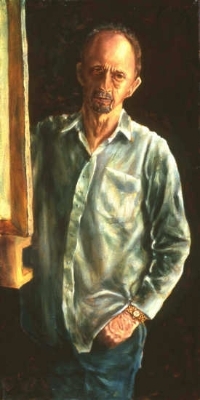 My painting style reflects this both in my portraits and other figure work. I also work in what might be called a completely different style which I have come to call my "swirly" paintings. These are abstracts done with an undulating movement to the lines that allow the viewer to create his or her own interpretation sometimes bordering on art nouveau. Take the time to wander through the different galleries to see the work and read over the other material to learn more about my work and me. You can purchase paintings and prints online through the secure shopping system. Feel free to contact me with questions about my work and my classes using the Contact Form.